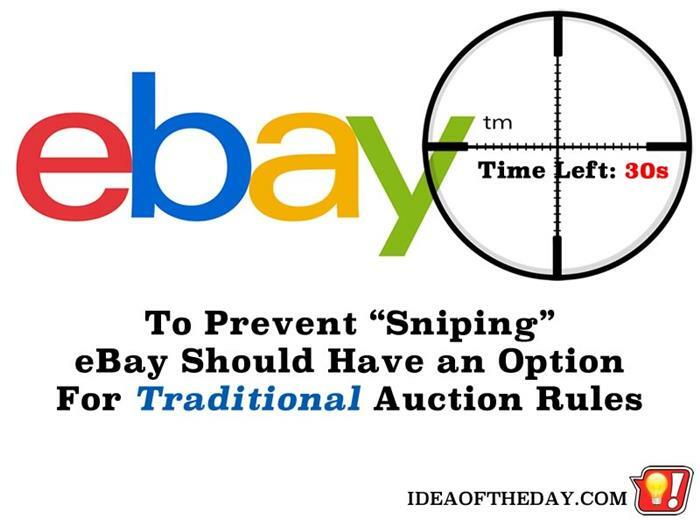 Why doesn't eBay offer REAL Auction Rules to Prevent Sniping? Don't you hate when somebody outbids you on eBay at the last second? For what it's worth, eBay may call themselves an auction site, but they don't use REAL auction rules, which has a big effect on the outcomes of many of their auctions. Unlike a traditional auction, eBay has a preset end time for each auction, making it easy for people to take advantage of the time limit and only bid at the last minute, making it impossible for anyone to bid again. This is known as "Sniping", because the final bid comes in out of nowhere at the last second. Your Winning auction ends in 12... 7... 3... You have been outbid. You were the top bidder for 7 days straight, then somebody outbid you with 3 seconds to go. How did that happen? Many people forget that eBay's rules for ending an auction are nothing like the way a traditional auction is supposed to end. When somebody lists something for sale on eBay, they set a time limit on when it ends. Whoever is the top bidder the moment that time runs out... wins. Because of this, many people set reminders of when an auction ends so that they can bid at the last second, leaving no time for anyone to bid higher. That's called "Sniping".